Andrew Bird has released a couple of fun little EP’s this month, both with plenty of Kyma touches throughout. “Keep Climbing The Mountain” features plenty of Euverb, Granulated Guitar and Subtractive Synthesis sweeps and hits to create the atmosphere behind the energetic “In My Skies”. And on the Robotronic EP, Kyma is doing all of the vocal harmonising and vocoding. Both EPs will have you smiling and on your feet dancing within nanoseconds, and both are available on iTunes. There’s a fascinating piece by Mel Lambert on the Editor’s Guild web site, giving details of every aspect of the sound—from dialog to Foley, to mixing, to creative sound design— for JJ Abrams new science fiction film, Super 8. In it, master sound designer, Ben Burtt details how he used his own voice to control a bank of sounds in Kyma, performing it like a musical instrument to create the voice of the alien. Burtt says that he wanted to create a character who, although alien, had an expressive soul, purpose, and rationality. Once Industrial Light & Magic, which handled visual special effects, heard Burtt’s vocalizations, they were so inspired that they added a tongue to the creature’s mouth! One of the few times that they created picture to sound, instead of the other way around. Full of insider tips and tricks ranging from how Burtt sustained the tension in a long train crash scene to how Matthew Wood compensated for young actors’ voices changing over the course of the shoot, the piece is essential reading for anyone who’s serious about sound design! Rumors of a secret Metallica recording project were finally confirmed on June 15, when Metallica announced on their web site that they’ve just finished recording a full-length album with the legendary Lou Reed. 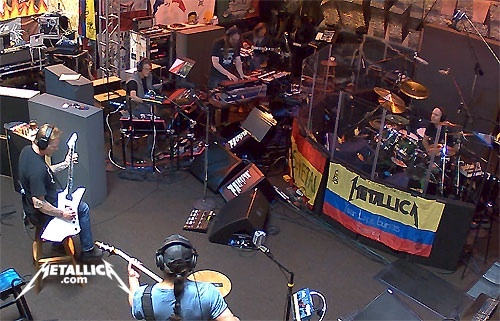 In the photo (http://www.metallica.com/images/Metallica_LouReed_wide4.jpg) you can see Lou Reed (seated on the left) and Sarth Calhoun (standing on the right) with his Continuum and Kyma + Paca setup. Everyone is looking forward to hearing the final result (with the possible of exception of one evil psychopath). On Friday, June 24 at 10 pm, Scott Miller will be performing live on Kyma along with British vocalist and sound artist Viv Corringham and members of Zeitgeist as part of the Twin Cities Jazz Festival‘s Free Studio Z concerts in Minneapolis/St Paul Minnesota. Electroacoustic music with some terrific vocal and instrumental improvisers! Amon Tobin & Tessa Farmer ‘ISAM: Control Over Nature’ Preview from Ninja Tune on Vimeo. Amon Tobin has just launched ISAM — an album, audio-visual live performance tour and art exhibition — pairing Tobin’s original and evocative music with Tessa Farmer’s intriguingly organic sculptures. Both artists, Tobin in sound and Farmer in sculpture, explore the rearrangement of the “familiar” in disturbing, playful and highly original ways. Imagine opening the specimen drawer in a darkly lit Victorian-style natural history museum in a parallel universe while a steampunk science-fiction-meets-Sgt.-Pepper score plays in the background and you’ll start to get the picture. In ISAM, Tobin uses Kyma to successfully blur the distinction between sound design and music: transforming sound effects into drippy, gurgly beats that sound like they were emitted from steam-powered machines; continuously gliding pitches seamlessly morph into harmonic anthems; and repeating rhythmic and harmonic patterns with endlessly changing orchestrations and backgrounds; glockenspiel fairy tales juxtaposed with aliens bursting unexpectedly out of bubbling tar pits. The music is evocative, cinematic, and highly original: chopped spectra with hints of vocal resynthesis; Klangfarben rhythms; electronic insects encountering R2D2, repeating distortion patterns; the soundtrack from a childhood nightmare set to a swinging 6/8 nursery rhyme beat; sitars followed by glass beads flung across a frozen pond at midnight; aliens dancing heavily & deliberately at BPM = 76; and those ubiquitous miniature skeletons dancing so wildly that tiny bones fly off at right angles, making tinkly sounds as they hit the floor. The audio quality is superb, always crisp, clean and masterfully mastered. Despite all the little skeletons, the overall atmosphere of ISAM is playful, rousing, and at times downright cheerful—and the BPMs hovering between 76-88 make it the perfect iPod soundtrack for strutting in the city or skipping your way through a crowded airport.